Chicken Mayonnaise Rolls are our favourite Its mandatory to make Chicken mayo rolls for parties picnics or Sunday breakie at my place. My Hubby dearest loves chicken mayo rolls and sandwiches .Making Chicken Mayo rolls at homes is super easy if you have Homemade Mayonnaise ready at home. My homemade mayo comes handy to make such rolls sandwiches and dips. These Chicken Mayonnaise rolls taste super delish and far better than the one we get on bakery and Cafe's .Since we make it at home we use the best ingredients possible. You can add cheese and more veggies to make it more yummier. Boil the chicken with salt pepper powder and 1 tsp ginger garlic paste . Once boiled shred to pieces. In a bowl mix Mayonnaise ,shredded chicken,pepper powder mustard paste( if using )and mix. Serve with some chips and juice or coffee . You can wrap the rolls in the cling foil and refrigerate for later. Do not over cook the chicken it will turn hard and chewy. I prefer my rolls to have chunky shredded chicken you can pulse it once in the mixie after shredding. You can add some cream cheese as well . Mayonnaise takes less than 10 minutes and is made with simple ingredients easily available at home .You can use it as a sandwich spread or as dip .Mayonnaise is base for most of the salad dressings .I will share salads and dips using this mayo in the coming days . Making Mayonnaise at home is super easy ,all you need is basic ingredients a hand blender or a mixer and just 10 minutes. Without added preservative and artificial emulsifiers you can make thick delicious mayo at home which stays well for a week.You will never o back to the bottled ones Once you make your own Mayonnaise. I have been doing this since more than 20 years now .Try this recipe for foolproof thick and perfect Mayonnaise. 1 tsp sugar If you prefer less sweet add 1/2 tsp. Take a bowl or blender jar . Break one egg and mix in sugar salt and vinegar. Start blending with a hand blender on high speed. Gradually add oil and beat until you get white creamy thick mayo. Keep adding oil till the mayonnaise turns thick . Start adding oil little by little and keep beating until the whole 1 cup oil is used and the mayonnaise turns thick. Using a spatula remove it and store it in air tight container. Fish Thali very popular thali among sea food lovers .Fish Thali is a complete meal consisting of Rice, fish curry fried fish some salad and a sprouted mung matki usal or any veggie/sabzi. Fish Thali or Fish meals are popular in seafood or Gomantak Restaurants. Fish curry rice and fish fry is our staple and we have it atleast 4 times a week .I will share more of such seafood thali in the coming days .You may check out other fish curries and fry in the blog as well . I have been a fan of thali right from childhood be it any veg or non veg I thoroughly enjoy it though i was never able to finish the entire thali all by myself .We love such simple home style thali /meals which are so simple yet so delicious. Do try and you will love it too.I will share the mung matki /moh bean usal soon for now enjoy this . 1 /4 tsp haldi turmeric powder. To the cleaned fish fillets apply salt and turmeric powder and keep aside for 15 min. Grind the coconut with chillies coriander seeds cumin and red chillies,ginger garlic adding little water to a paste. Soak the tamarind in 2 tbsp water . Add oil once hot ,add curry leaves. Then add the masala paste and the powder and fry well for 3 to 4 min . Add water according to the consistency of the gravy you need and let it cook over medium flame . It will take around 15 min to be ready. once the fish is cooked add the tamarind pulp also adjust salt if needed. Switch the flame off . Arrange the thali ,Here I have served Rice ,Surmai fish curry ,mung matki bhaji,Surmai Fish Fry ,chapati and some salad .You can add pickle dal or any more sides as needed . Fruit Punch is a perfect refreshing beverage /Cooler to beat the scorching heat. Summer is here already and the heat is just unbearable. At such times these chilled beverages keep you refreshed I personally don't like eating heavy meals in the afternoon for summers I prefer light meals with lots of juices and summer coolers which keeps me hydrated. This Fruit punch is one of my favourite summer drink along with lassi and smoothies. Fruit punch is super easy to make and taste too delish .You will feel refreshed and energised with a glass of chilled Fruit Punch. This non alcoholic fruit punch is a hit at parties as well they are loved by kids and adults alike . Refrigerate for 30 min to 1 hour. When you are ready to serve it add ice cubes ,Soda or lemonade and pour it in individual glasses with lemon slice strawberry slices and any pulpy fruit of your choice. You can use packed or freshly extracted juice . Sugar can ne adjusted as per choice Since I used fresh juices I didn't feel the need to add extra sugar . You can make this punch ahead and freeze some into ice cubes and later add to the fruit punch mix . Butter Chicken Biryani or Murgh Makhani Biryani is a flavorful mild spiced biryani . I am die hard biryani fan and have shared few in the blog too .Wanted to try the new fusion and talked about Butter Chicken Biryani since long and gave it a shot few months back .Butter Chicken and Tandoori chicken are few of the most popular recipe in my blog so I tried this recipe with the fusion of these two recipe and must say it turned out to be outstanding. Fry the slice onions till golden brown and grind approx 3 fried sliced onions to paste and keep the rest aside for layering. Grind the tomatoes and cashews to paste . Add salt and the soaked rice and cook the rice till 3/4 th done . Heat oil and butter in a pan add bay leaves then add ginger garlic paste ,saute till raw smell goes off. Add the tomato paste and saute till oil separates. Now add the brown onion paste and saute for few minutes . Add chilli powder ,garam masala powder and kasuri methi. Add 1 tsp of sugar or honey . Now add cream and mix well. In a thick bottomed vessel add 1 tbsp ghee or oil and spread . Spread the fried onions and some mint and coriander leaves. Drizzle warm ghee and saffron infused milk . Drizzle rose water and cook on dum for 15 to 20 min. Serve with raita ..I.enjoyed it with fried mutton chops and some cucumber raita. Chicken Cheese Nuggets or Chicken Nuggets a popular snack or appetizer loved by kids and adults equally .Chicken Nuggets make a lovely evening snack.Chicken Nuggets can be enjoyed with any dip They make a great option for snacks and lunch boxes as well . 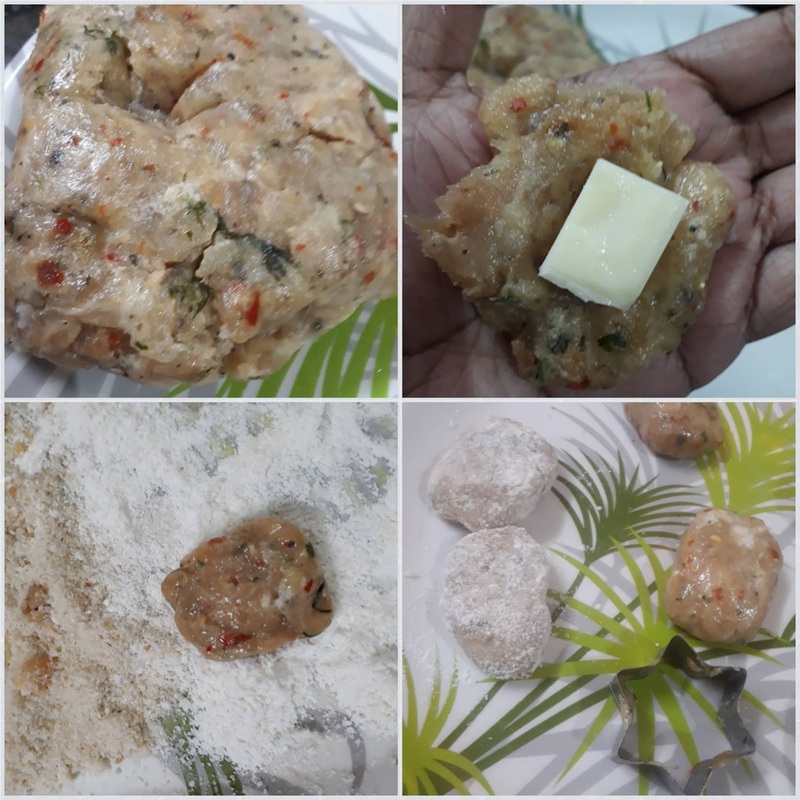 Frozen Chicken Nuggets are handy when you have guest home or when you want to have something yummy and don't want to stand for long hours in the kitchen.We love nuggets and always keep it ready at home .Homemade chicken nuggets are economical and easy too.Not to mention they are free from preservatives or artificial flavouring. 1 tsp coriander chopped finely . Wash the Chicken Breast and pat dry . Take a bowl add the Chicken ,salt,lime juice ,butter,herbs pepper powder ,oregano,ginger garlic paste,garlic powder , coriander chilli flakes and mix well. Once you are done shaping all dust each of them in the flour and set aside . Again dip in the egg mixture and coat it with breadcrumbs. Keep them in the refrigerator for 30 minutes to 1 hour or freeze it storing it in air tight container . Heat oil in a pan and fry until golden brown . Serve it with ketchup or any dip . I have used chicken breast you may use boneless pieces as well . Freeze the tray for an hour or 2 and later pack them in Ziplock bags or air tight container and fry as and when needed . You may add grated cheese to the mixture and skip adding cubes on the centre . You can shape it using cookie cutters . You can feel fry until golden brown I always shallow fry them. These can be baked as well. Fruit Punch /Fruit Punch Recipe.